When a chat conversation is closed by either the agent or the customer, the customer is prompted to give feedback, both as a thumbs-up/thumbs-down and as free text. 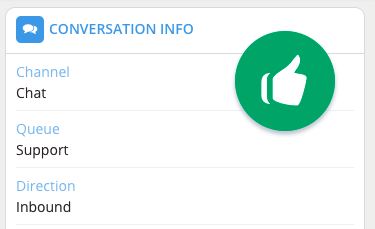 The customer can also give feedback during the chat by clicking thumbs-up or thumbs-down at the top of the chat widget. 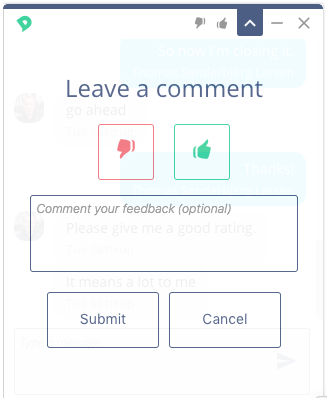 If the customer has left feedback for a chat conversation, it will be displayed in the conversation informaion under feedback, and the agent will recieve a notification that he or she has received feedback. How the chat widget looks to the customer after a conversation (and you can see the thumps-up/thumps-down at the top of the widget too). This is how the agent is notified of feedback. This is how feedback is logged on the conversation for anyone to see later.